Indeed in the so called Kon Jot Forest (a mosaic of remnant old-growth subtropical-tropical forest patches) mature trees of Pinus dalatensis occur at around 1100 m. Although it was thought to be the lowest find, and that the species exclusively occurs in the territory of Vietnam, in 2006 the discovery of a population with over 200 trees was reported from Lao PDR (Thomas et al., 2007), from elevations between 800 and 1100 m! Based on this and other, older references the full altitudinal range now known is 800 to 2400 m. – Kon Jot village in Dak Doa district is found 50 km in a straight line of Pleiku, at 740 m elevation, with a climate that has a relatively dry and hot period from November to April/May, and a wet, humid, less hot period during the rest of the year, with a rainfall of 1,800–2,000 mm. The primary forest with Pinus dalatensis near the village is now strictly protected, logging is not permitted. Scattered large trees reaching 36–38 m are numerous and some seedlings were also observed (but, interestingly, no smaller tree than ca. 25 cm in trunk diameter was found). In the seemingly untouched forest trees). Other non-conifers included Lithocarpus dinhensis, Litsea cf. monopetala, Memecylon acuminatum, with shrub-size associates such as Eurycoma longifolia subsp. longifolia, Garcinia gaudichaudii, Ixora coccinea, and Mallotus apelta. Nearby, there was one medium-sized tree of Podocarpus neriifolius. 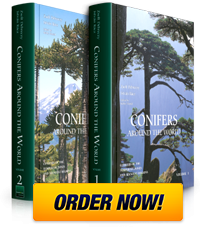 Further information on the subject has been written in an article, also, in Conifers Around the World, page 400. It is acknowledged that the assistance of Prof. N. D. Chinh, Department of Ecology, Da Lat University, the leaders of the Mang Yang Forest Station, and trip leader Dr. D. D. Huyen, from the Hanoi herbarium, was most helpful in documenting this remarkable pine. Photos here show a large tree approaching 40 m in height with a trunk diameter of 110 cm (with István and Huyen), and one picture on right, Mr. Elemér Barabits, a Hungarian nurseryman who also supported the exploration. One photo shows two persons, Dr. Chinh on the left and Dr. Huyen (right).